In a past article I discussed the fact that crocodilians have the ability to swallow underwater (CSG Newsletter Volume 22, Number 1, Jan.-March 2003). While they often come to the surface to swallow prey, they don’t have to. They can expel the extra water by squeezing it back out of their stomachs. Of course we all assume that alligators purposely drink water, but it is rarely witnessed. 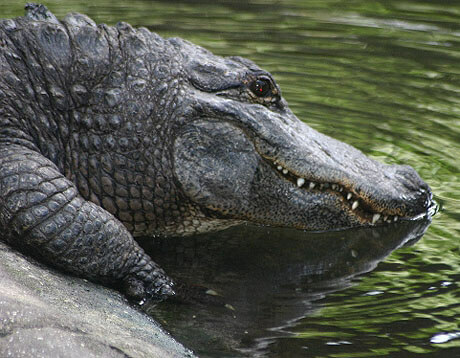 In September 2004 I witnessed an adult female America alligator Alligator mississippiensis drinking water. She had been out of the water most of the night and when I noticed her she was still lying on land. She moved her head over the pond and let her lower jaw settle into the water. She tilted her head down toward the water at almost a 45-degree angle. From the side I could see that she was lowering her tongue, creating a pouch that filled with water. At the same time she was opening her palatal valve. She used her palatal valve and her tongue to push the water to the back of her throat. Her intake of water went on for almost five minutes. I was able to capture a short segment on video. In this video her mouth is closed, but you can see her swallow and see excess water squeeze out from the back of her jaws.